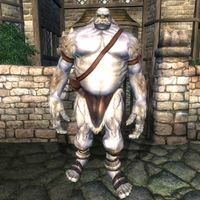 Ogres are large, seemingly dim-witted humanoids found throughout Tamriel. Best known for their great strength and foul smell, ogres have steely blue skin, pronounced teeth, and elven ears. They have shaggy white hair, which can cover the entire body of those found in colder regions. Ogrim (or Ogrims) are enormous Daedra with very little intellect, but which are chiefly sent into the mortal world to menace living things for the amusement of Daedra Princes. 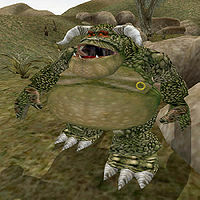 Ogrim are associated with Malacath. They are immune to normal weapons and can regenerate health. A type of fish that can be found in the oily waters of the Clockwork City. 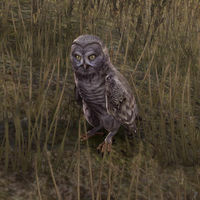 Owls are nocturnal birds found in Tamriel. The Owl known as Wise-Wing is associated in northern Tamriel with the god Jhunal or Julianos. 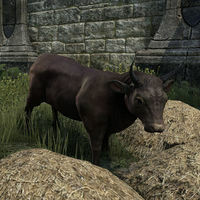 Oxen are common beasts of burden on Tamriel. They are raised for their meat. This page was last modified on 14 December 2018, at 01:48.